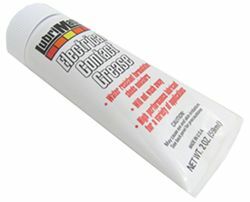 Dielectric grease is used to keep moisture out of the electrical connections on your wiring and to inhibit corrosion. Typically applied to permanent connections, it also can be useful with temporary electrical connections, for example, with infrequent towing. Dielectric grease is a lubricant composed of petroleum grease with an added thickener. 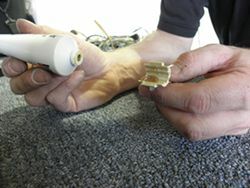 Apply a thin line of grease across the length of the plug prior to making the connection. You can also apply it to any plug with a cover to keep moisture out of the plug between uses and during use. Can be used on plug prior to connecting to keep out moisture. Apply a thin line across the plug prior to attaching to back of tail lights. 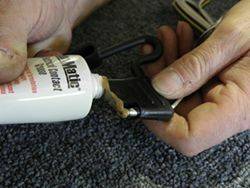 A little dab prior to inserting wires in the quick connect gives a corrosion-resistant barrier. When you are securing a ground wire to your vehicle or trailer, you can apply a small dab of dielectric grease on the surface where you will be drilling and simply drill through it and into the steel. This pushes the grease onto the threads and into the steel and protects the connection. 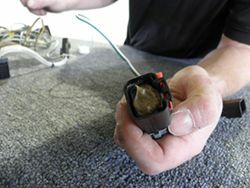 Make battery posts last longer and keep corrosion from starting by cleaning and applying a thin layer of dielectric grease, then making your connections. Conductivity is a material's ability to conduct an electrical current. While dielectric grease is not a conductor of electrical current, it does help to preserve the integrity of the metals by reducing corrosion. A small amount of dielectric grease between conductors can also allow a charge to pass through.